The museum recently acquired two significant objects for its permanent collection which provide an opportunity to explore the road to reconciliation for Australia’s Indigenous people—a message stick and a kangaroo skin petition book. The objects document the Freedom Ride 2011 which celebrated the impact made by the original Freedom Ride in 1965 and supported the constitutional recognition of Indigenous people. In 1965 a group of students from the University of Sydney embarked on a bus journey through parts of New South Wales to confront racial discrimination and inequality in country towns and to survey the conditions in which Aboriginal people were living. The group demonstrated against entrenched racism and segregation at places such as Walgett RSL club, Moree swimming pool, Bowraville cinema and Kempsey swimming pool. Led by Charles Perkins, who was to emerge as a prominent Aboriginal leader, the ride was successful in attracting urban media attention to the plight of Aborigines in country towns and taking that message to the wider Australian public. Significantly, the Freedom Ride was a precursor to the 1967 referendum which approved two amendments to the Australian Constitution enabling the Commonwealth to make laws for Aboriginal people and including Aboriginal people in national censuses. Freedom Ride 2011 began in Sydney on 12 February 2011 and followed the route of the 1965 Freedom Ride, passing through 21 communities on its 2,300km journey through northern and coastal New South Wales. The ride visited the towns of Orange, Wellington, Dubbo, Gulargambone, Walgett, Collarenebri, Moree, Boggabilla, Warwick, Tenterfield, Glen Innes, Inverell, Grafton, Lismore, Cabbage Tree Island, Coffs Harbour, Bowraville, Kempsey, Taree, Newcastle and Wyong before returning to Sydney on 26 February 2011. The ‘Young Freedom Riders’ comprised 25 Indigenous and non-Indigenous students from the Central Coast, with a support staff including Aboriginal elders and staff from Koori Connect, the Aboriginal unit of Central Coast Youth Connections, who initiated the project. The message stick and petition book acquired by the museum travelled with the ‘Young Freedom Riders’ on their journey. 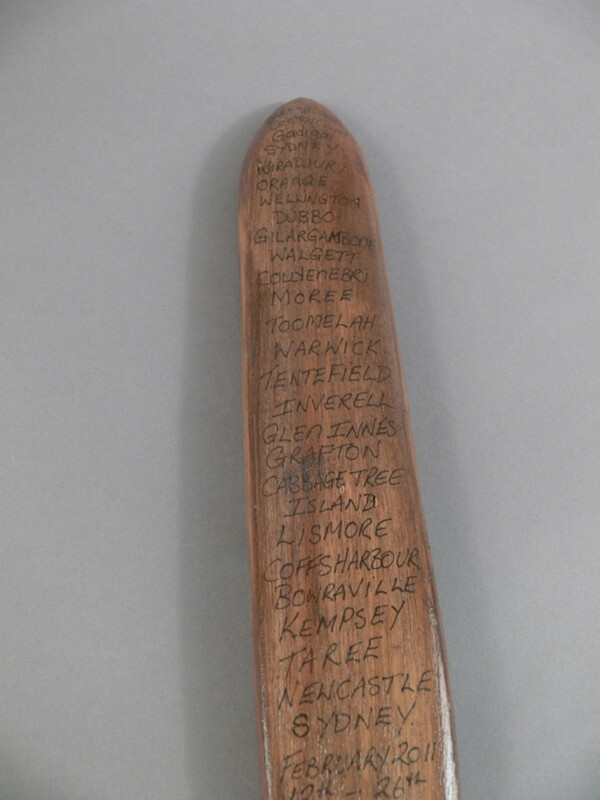 The message stick, a traditional means of communication used by Indigenous people throughout Australia, is handcrafted from wattle and inscribed with the names of the towns on the itinerary of the ride. The accompanying kangaroo skin petition book contains names and messages gathered from the people in the communities that the ride visited, chronicling local opinions on constitutional reform. 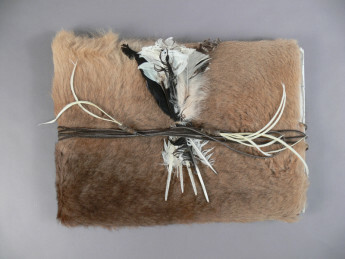 The message stick and kangaroo skin petition book are welcome additions to the museum’s collection. They remind us of the importance of the 1965 Freedom Ride in raising the awareness of non-Indigenous Australians of the Aboriginal experience in rural and regional Australia. They also enable the museum to engage with the present conversation about constitutional recognition of Australia’s Indigenous people. These wonderful objects are indeed a tangible expression of democracy in action. Kangaroo Skin Petition Book used during the Freedom Ride 2011. Created by Kylie Cassidy. Museum of Australian Democracy Collection. Steven Murkett graduated from the Australian National University in mid-2011 with a Master of Arts specialising in Art History and Curatorship. During the final year of his degree coursework he volunteered in the Asian Art Department of the National Gallery of Australia before joining the Heritage team at the Museum of Australian Democracy in December 2009. As a Registration Assistant Steven enjoys working with the vast array of objects in the museum’s collection, including the original furniture designed for the building, and has a personal interest in collecting antique Chinese furniture and early twentieth century decorative art and design.